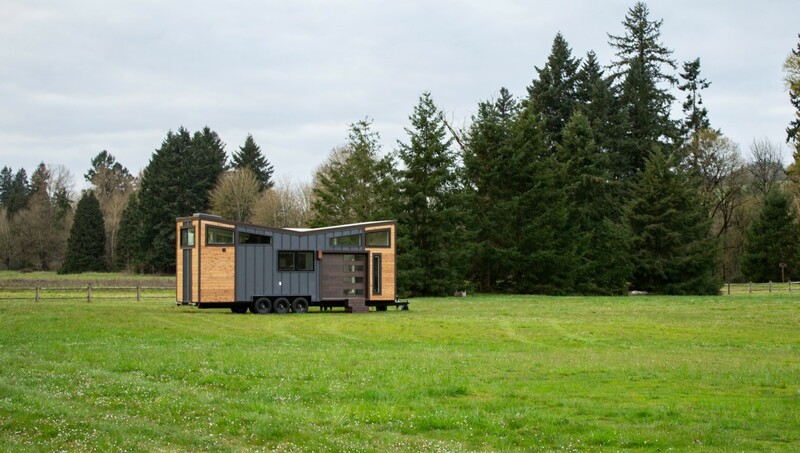 Tiny Heirloom is known for building exquisite tiny houses on wheels, but their latest home is geared to raise the roof. While most tiny homes are designed as living or vacation spaces for couples or smaller families, the high-end Breezeway home was strategically designed for socializing. The modern cabin is equipped with a wet bar and a large garage-door wall that opens up completely to make room for guests. 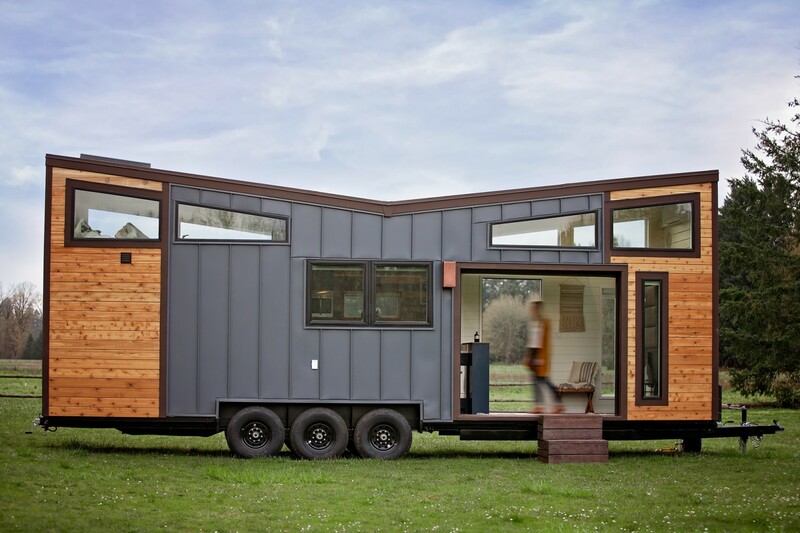 The tiny home is built on a 30-foot-long triple-axle trailer, so it can be towed virtually anywhere. Clad in a mix of standing seam recycled steel and tight knot tongue and groove cedar and topped with a cool butterfly roof, the home has a rustic but sophisticated look. This modern cabin feel continues on the inside, which was laid out with socializing in mind. 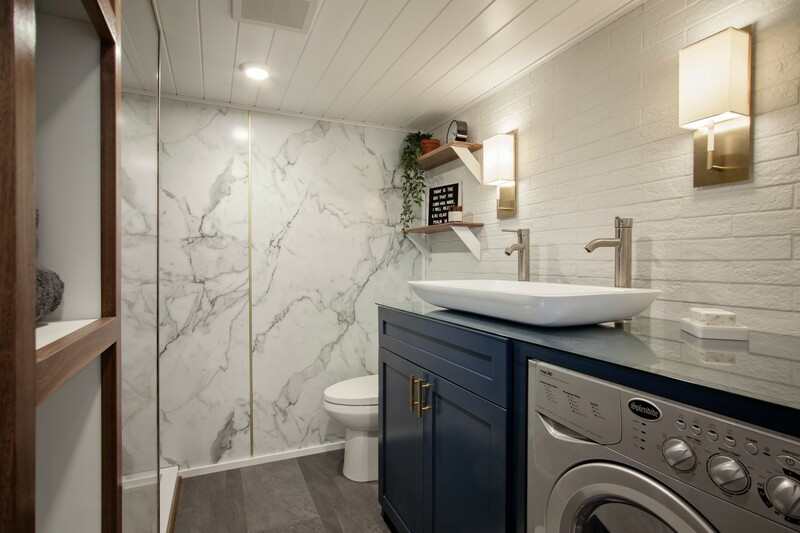 Most tiny homes don’t factor in the need for social space, but the Breezeway’s interior design was left relatively empty to create a flexible area. There is enough room for ample seating and a table. The home has two main doors: a regular wooden door and a large garage-style door, which opens up the interior and creates a fun indoor/outdoor party area. Adjacent to the kitchen, a pop-up TV is perfect for movie nights or game days. On one side of the living room, the spacious kitchen provides full-size appliances to prepare food for large groups. At the heart of the area is a wet bar with a large seating area. The sleeping loft, which is large enough for a queen-sized bed, is accessible by ladder. A skylight floods the space with natural light. A TV mounted on a swivel and connected to a Bose sound system can be viewed from the bedroom or kitchen. Tiny Heirloom is known for their exquisite tiny homes on wheels, but their latest design is geared to raise the roof. 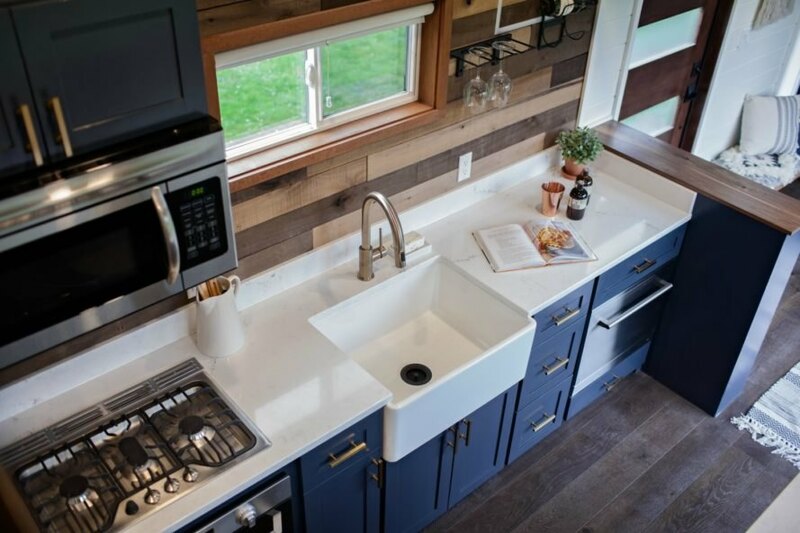 The modern cabin is equipped with a wet bar and a large garage-door wall that opens up completely to make room for guests. 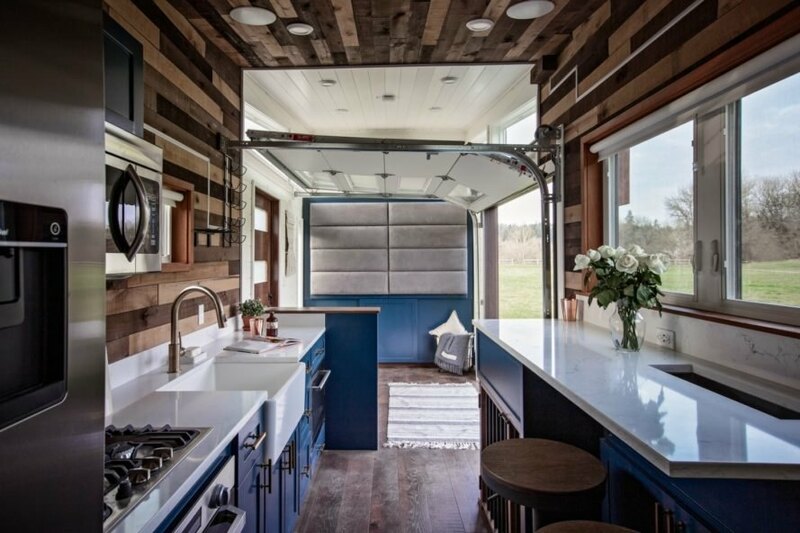 The tiny home is built on a 32-foot-long triple-axle trailer, so it can be towed virtually anywhere. The home is topped with a cool butterfly roof. 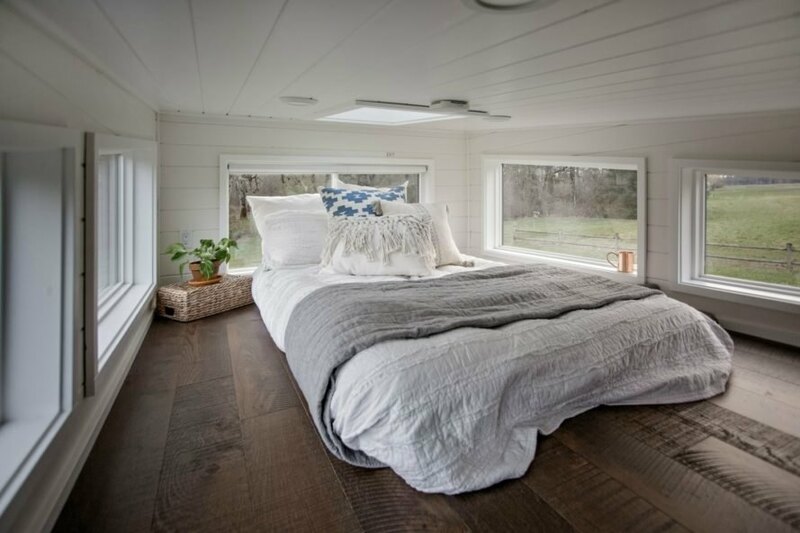 Most tiny homes don't factor in the need for social space, but the Breezeway's interior design is flexible to accommodate guests. The home has two main doors, a regular wooden door and a large retractable door. 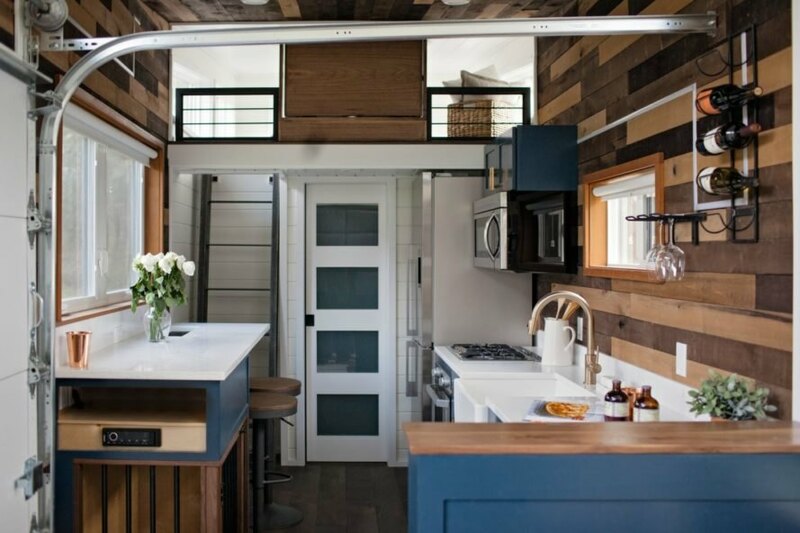 The Breezeway tiny home has a rustic but sophisticated look. 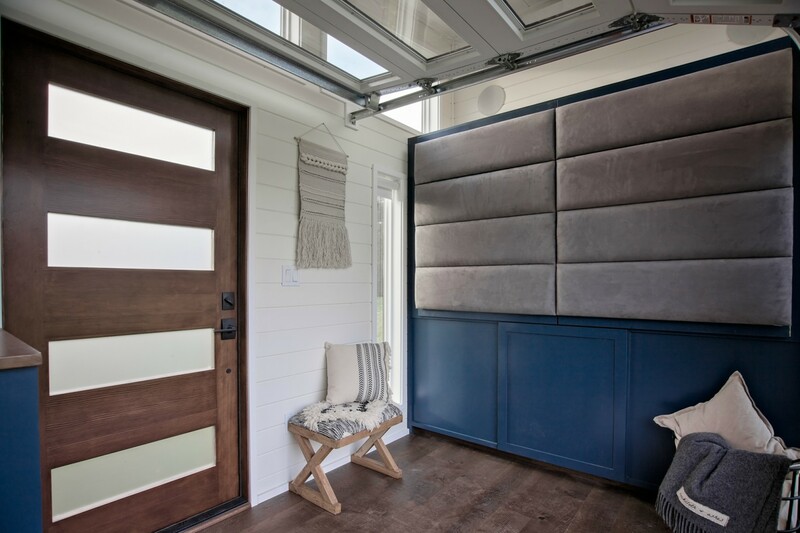 The large garage-style door opens up the interior to the exterior, creating a fun indoor/outdoor party area. The sleeping loft, which is big enough for a double bed, is accessible by ladder. The bathroom is quite big for a tiny home. 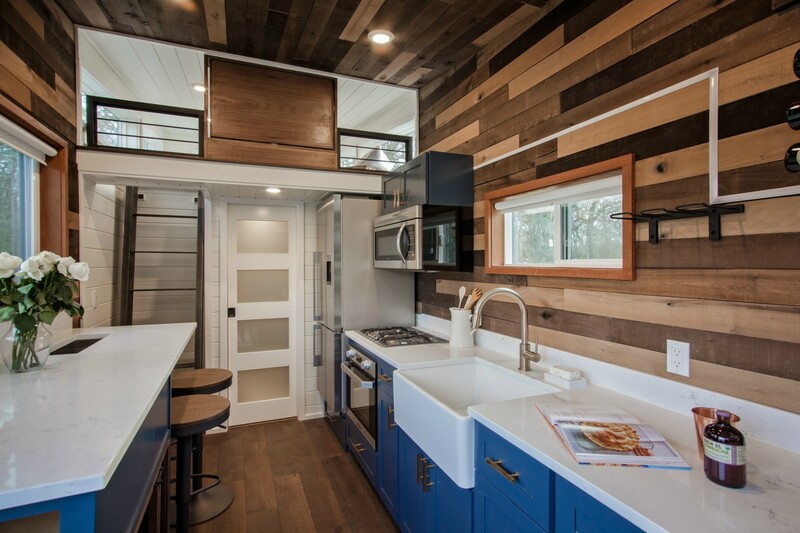 The kitchen backsplash was built with reclaimed wood. There is enough space for ample seating and a table. On the other side of the living room, there is a spacious kitchen with full-size appliances to prepare food for large groups. The kitchen has a rustic charm to it. A skylight floods the home with natural light. At the heart of the kitchen is a wet bar with a large seating area. A dog kennel was built into the space to keep pets inside while the party goes on outside. A pop-up TV adjacent to the kitchen is ideal for movie nights or game days. 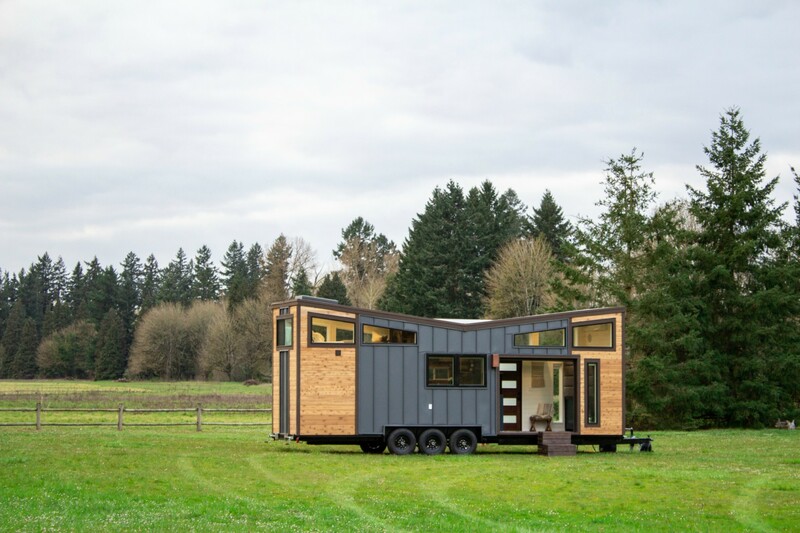 The tiny home is clad in a mix of standing seam recycled steel and tight knot cedar tongue and groove. Every part of the home was designed with socializing in mind. The retractable garage door adds space to the living area.